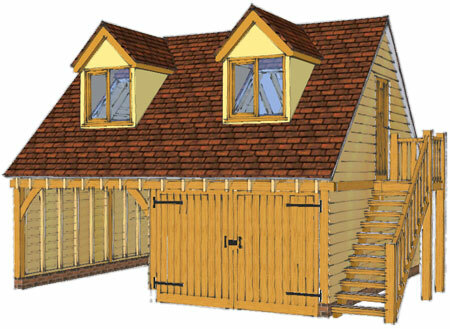 Our oak framed garages are made to exacting standards and follow traditional hand crafted construction methods. 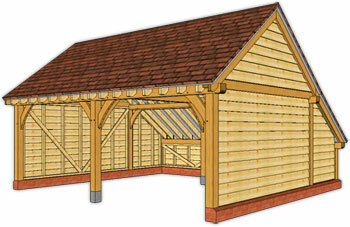 All available as ‘turn key’ completed buildings or as fully packaged kits. Our comprehensive kits are supplied with detailed plans and all elements are numbered for easy construction by capable carpenters, builders and DIYers. A simple single bay garage available in a variety of roof option designs, with options of full cladding or part open sided. We can supply doors for a fully enclosed building and various design options for side or rear log stores. A double open fronted garage shown with gable ends and a rear catslide roof to facilitate a lower ridge height, which usually makes planning permission approval easier (if planning is required). Various cladding and roofing material options are available; along with various design options which can include logstores and garage doors. 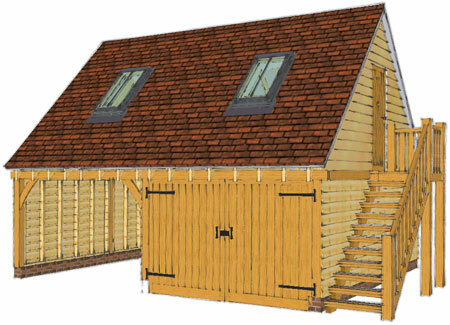 A triple bay catslide roofed garage shown here with hipped ends, rather than gable. There are many options and additional features available; please look at our options pages for a brief explanation of the terms used. This garage can also be part enclosed if you require more secure garaging in one bay for instance or supplied with ancillary accommodation above. 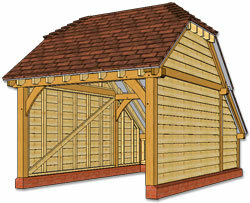 A popular option for adding ancillary accommodation to the main dwelling. Rooms over our garages can be utilised for a number of uses, such as a home office, games room or music room. Shown here in gable ended form with an external staircase and with one enclosed bay. This really is a wonderful addition to any property and as with all of our products, there are a many material and design options available, to customise to your exact requirements. As above this image shows a two bay with ancillary accommodation above but with dormer windows to provide further feeling of spaciousness and light. We can tailor each building to your exact specifications, including fitting all the relevant data cabling for home office use. If you want a turn key product please discuss your requirements with us.